Costa Rica 2017 here we come! We are so excited course participants have decided to embark on what is sure to be the trip of a lifetime! Costa Rica is one of the most ecologically and culturally diverse countries on the Planet, with a natural beauty that surpasses the imagination. We invite participants and their family and friends to Follow the Blog by hitting the Follow button on the right, so our journey can be shared by many, as we travel through multiple climate zones around the country, from the Caribbean (el Caribe) to the Pacific (al Pacífico)! To get an idea of some of the things we will experience, we invite you to click on the link below to a You Tube video created and produced by one of our film students on the course trip a couple of years ago. Special Thanks to Melissa Effa, Class of 2016! Day 16, Thur, July 27th – Tide pools and Snorkeling at San Juanillo Beach + Piñata for Ash’s 20th Birthday! Group Pics – Saying Farewell to our Costa Rica students and now Friends for life! Wed, July 26th, Walk in the Tropical Dry Forest; Explore Nosara Mangroves by Kayak; Stop at black sand beach to enjoy tropical fruit! 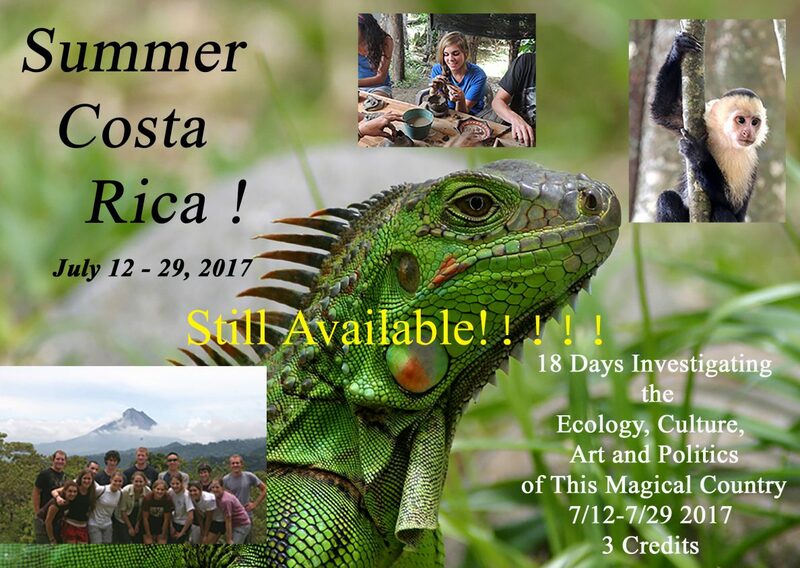 07-27-17 – At Hotel Giordano Tropicale in Nosara … Welcome to the Dry Forest!